Seattle in Washington, USA, is the natural starting point. Drive north on interstate 5, take exit 177 west along Hwy. 104, to Edmonds. At Edmonds, take the ferry across to Kingston (runs approximately every 30 minutes). From Kingston, continue along Hwy. 104, be aware that the road (104), makes a sharp right while Hwy. 307 continues straight. Stay on Hwy. 104 as it crosses the Hood Canal bridge, then merges onto Hwy. 101 going north, later more west. Hwy. 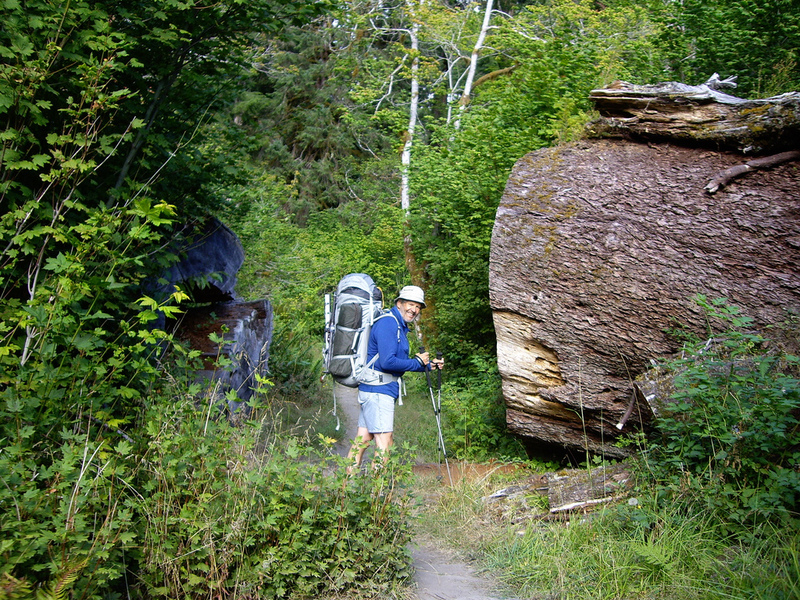 101 will take you to the city of Port Angeles where you may pick up your hiking permit at the local ranger station. Continue along Hwy. 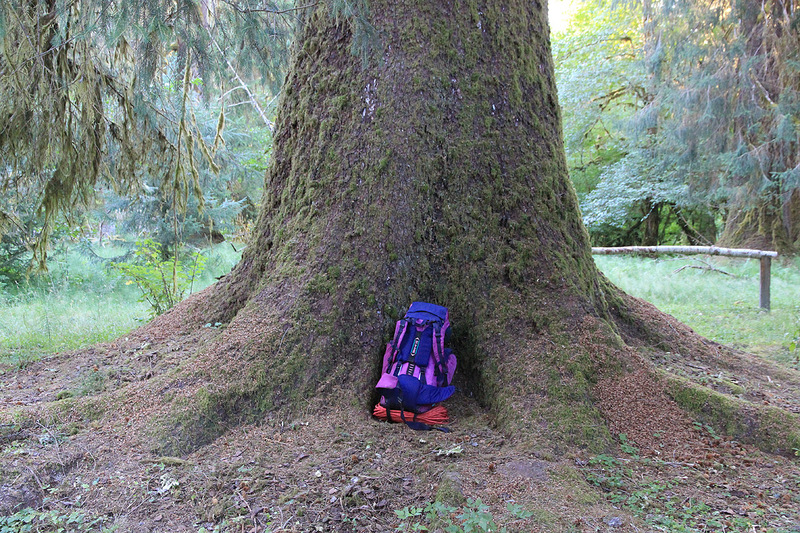 101 to Forks and then about 13 miles further, you will find a clearly signed road going left to the Olympic National Park, Hoh River campground and trailhead. This road is 17.9 miles long and ends near the visitor center. There is day parking as well as a special lot reserved for overnight parking. Park here, this is the trailhead, location N47:51.614, W123:56.063, elevation about 190 meter. Red Tape: Unlike some other national parks (noteably Rainier), this park is not very service minded. In particular, we experienced that the staff essentially ignores visitors from abroad, ie. they cannot reserve a permit without going through some local friends, so you better identify someone! The reason is that the park officials refuse to handle permit issue by email, the also refuse to return overseas phone calls and they insist to let a voice mail answering machine answer all incoming calls. So, if you try to organize a visit from Europe, you are out of luck. We can only hope that some park official decides to improve the situation, perhaps after reading this? Anyway, the way to secure a permit is "supposed to work" as follows: Call them at +1-360-565-3100, you will then get a long and irrelevant voice recording that you have to suffer listening to. Your phone bill (if calling from overseas) will keep going up. Eventually, you are given some options that will get you a new ring tone. This one will, in turn, transfer you to a voice mail where you are requested to leave your name and phone number in order for them to call you back. This seems to happen if the number you left is a US phone number. Overseas calls are NOT returned. 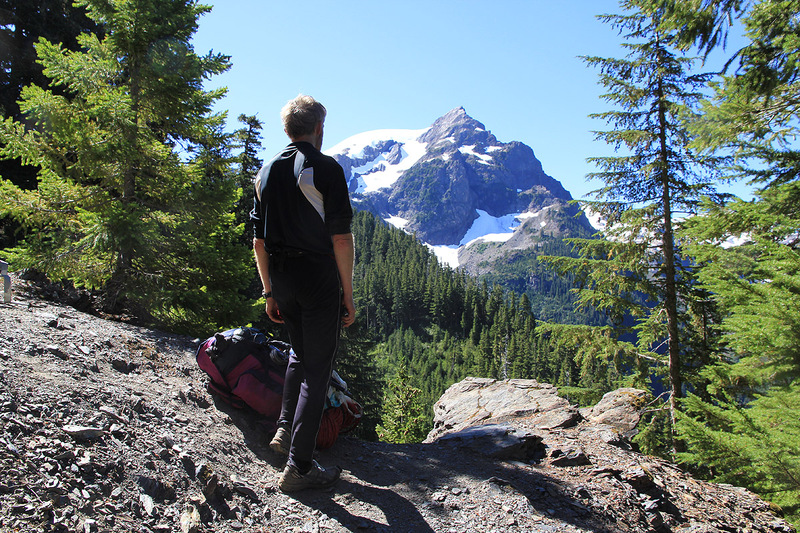 When and if you get in touch with a human being, then request a permit to hike the Hoh River trail and to camp at Glacier Meadows. They will then email you a confirmation that you then subsequently bring to a ranger station in order to pick up (and pay for) your actual permit. 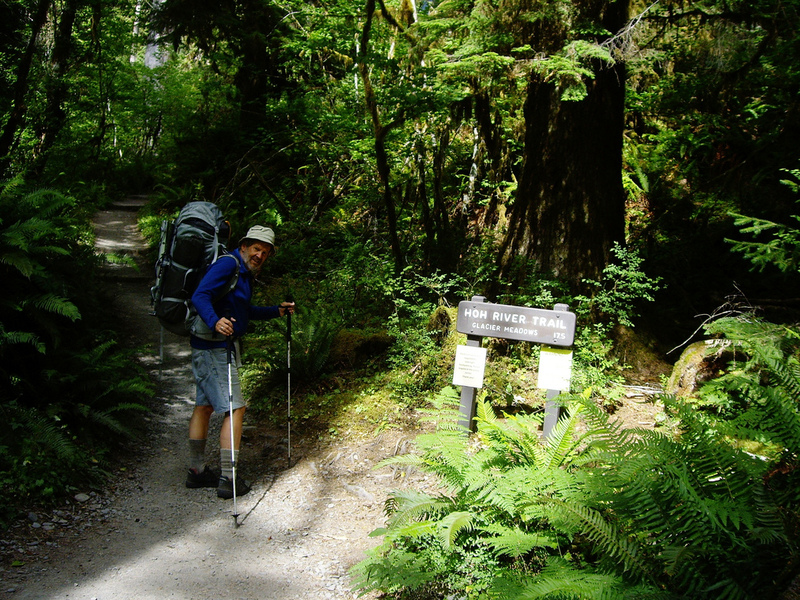 Approach:The trail starts out from near the visitor center, the Hoh river trail. This trail is well developed and has signs with milage now and then. 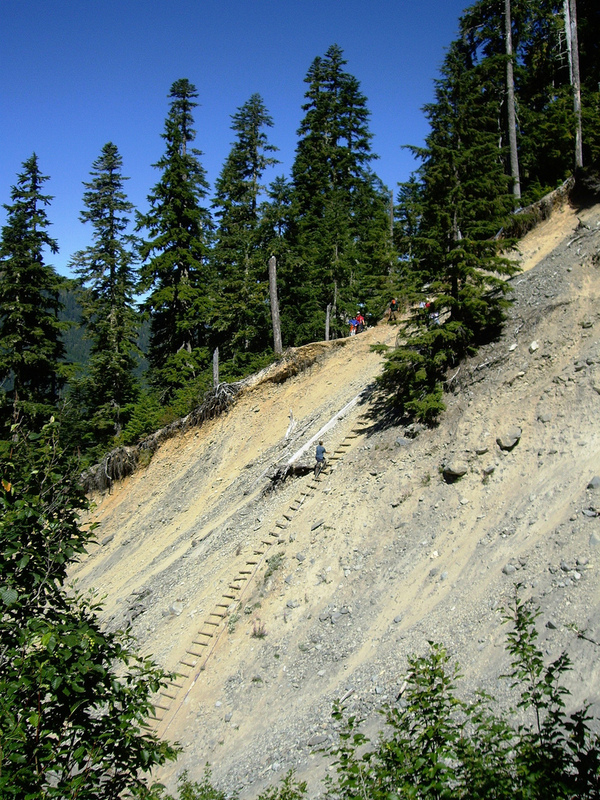 The trail is mostly flat with a few ups and downs as it runs up the valley with the Hoh river on its right side. 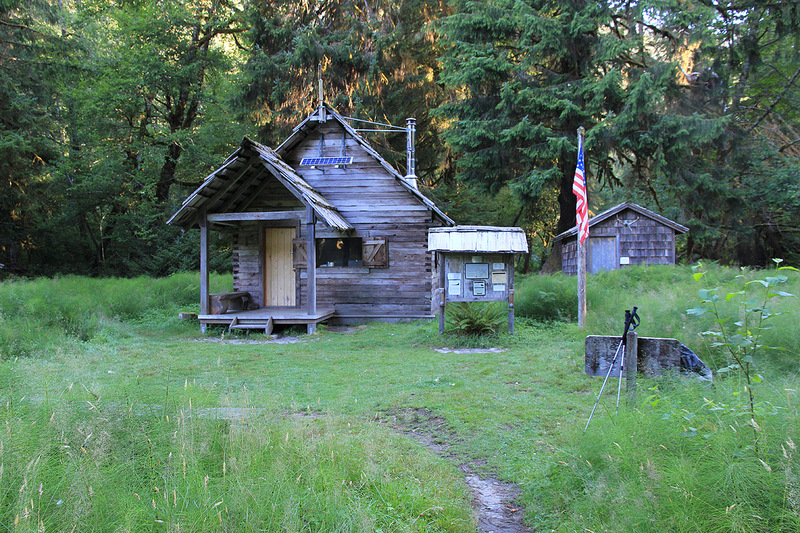 After about 14 kilometer, you arrive at "The Guard station", a small ranger station where there are campsites near the river. This is a good place to camp with a late start (having travelled in the morning). From the Guard station, the trail continues to Lewis Meadow Camp, about 2.3 kilometer, an alternative place to spend the first night. After about 6 kilometer from the Guard station (ie. 20 km from the parking), the trail finally starts ascending. You also loose some elevation here as the trail descends to the High Hoh bridge, a solid bridge across the Hoh river just above where it meets Glacier creek. 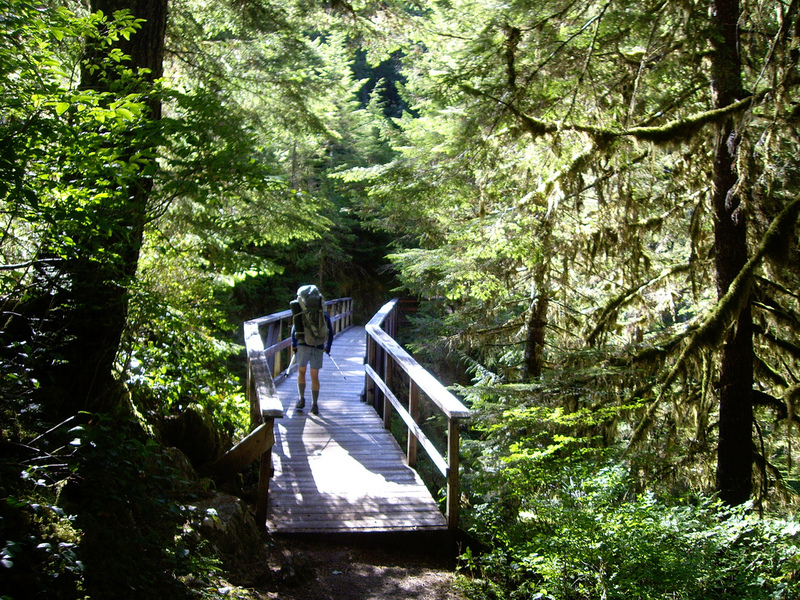 The entire trail is called Hoh River trail, however, from this point it really continues along (above) the Glacier creek. 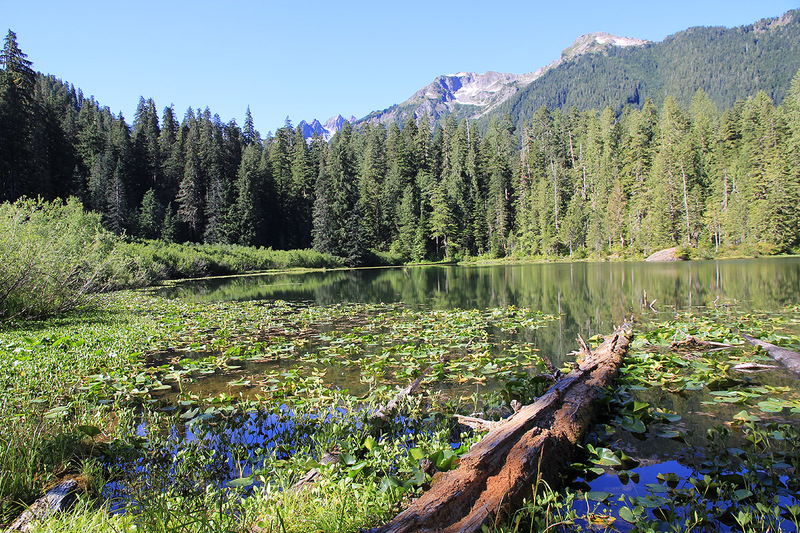 About 24 kilometer from the trailhead, you reach the nice little Elk lake at elevation near 780 meter, it is possible to camp here. 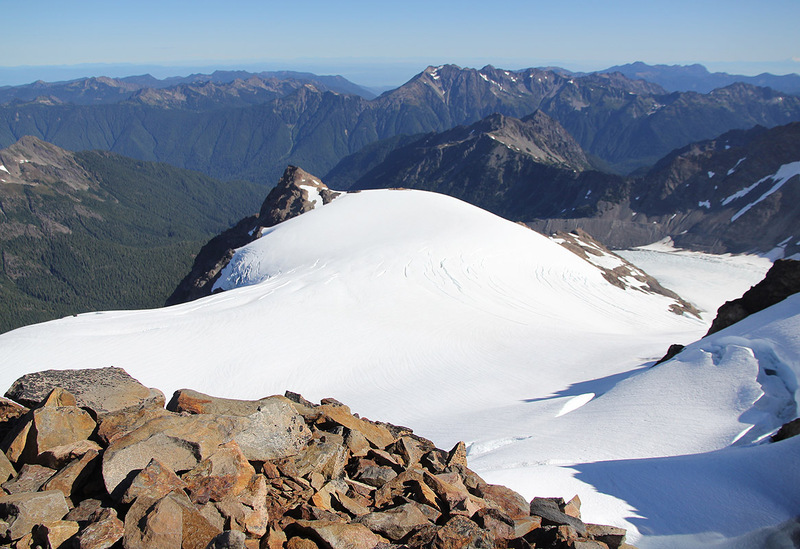 From here, the trail climbs more and takes on a more alpine character as it traverses a rather steep hillside while the vista opens up and you finally can see peaks with snow, Panic Peak (elev. 2075m) is visible straight ahead. The trail descends steeply a short section where a landslide destroyed the original trail before ascending the last slopes before arriving at Glacier Meadows, the distance from the trailhead is about 28 kilometer. 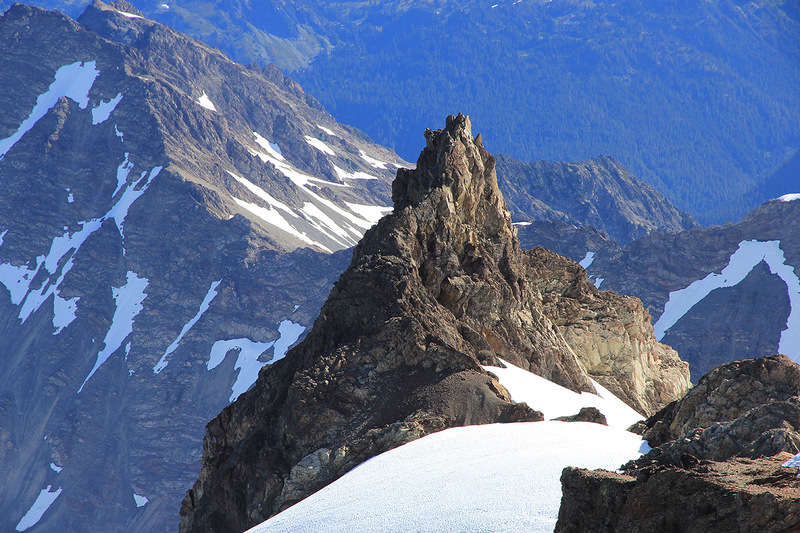 Glacier Meadows is the camp that serves as BC for climbing Olympus. It is really not a meadow at all, but rather the upper part of the forest before the treeline. 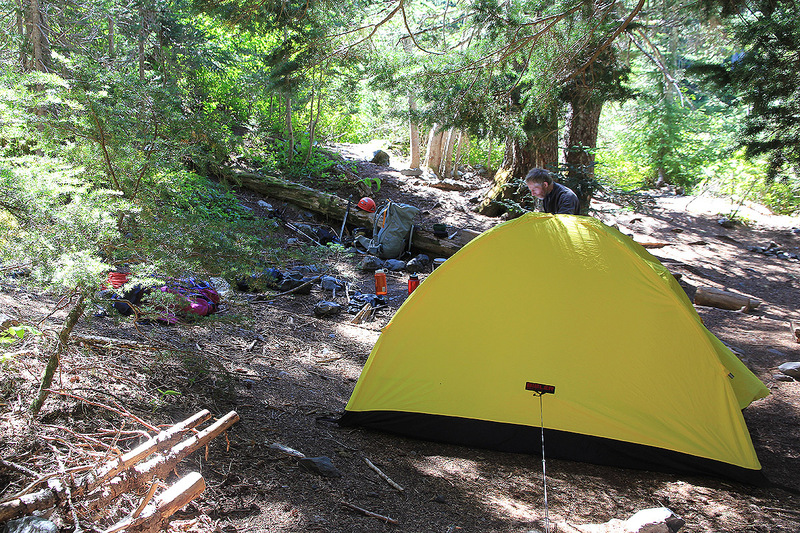 There are quite a few scattered spots that serve as designated campsites. 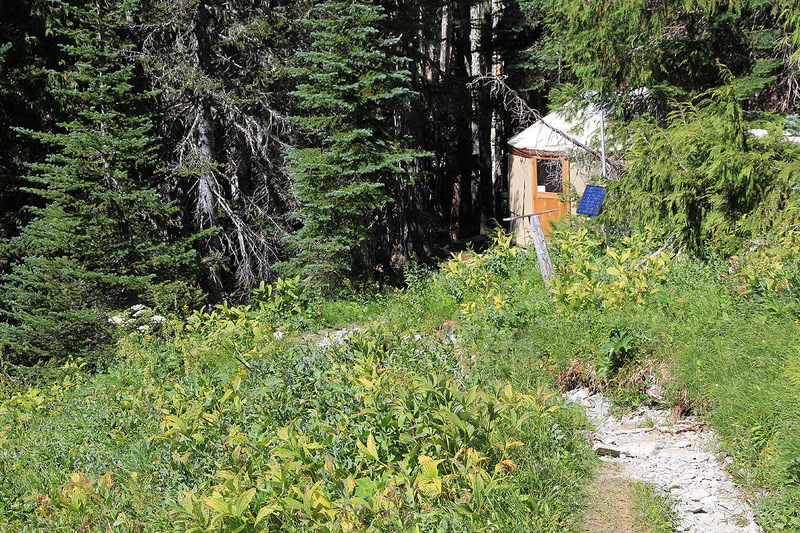 In the season, a ranger is on duty at the upper end of this area, staying in a tent based cabin. 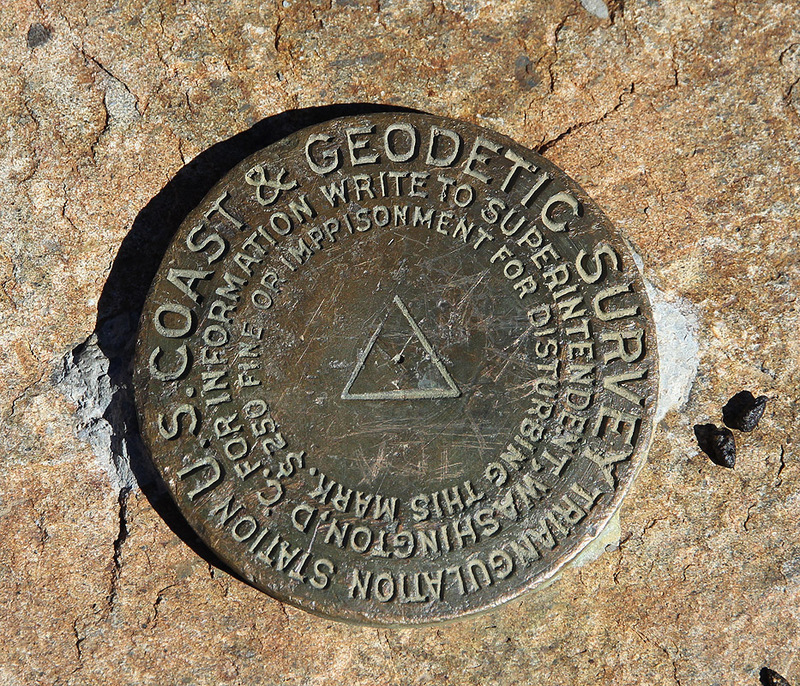 The elevation is roughly 1350 meter and the location is N47:49.946, W123:41.469. 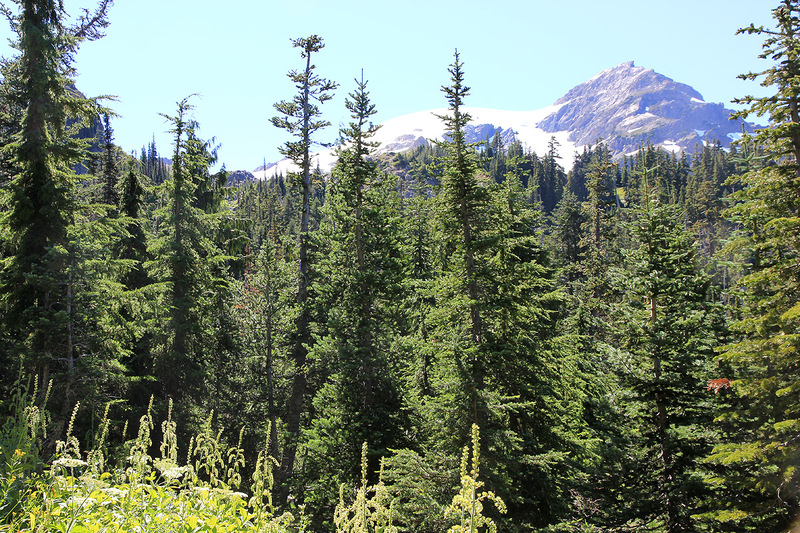 Climb: From Glacier Meadows, walk by the ranger station, there is a book to sign in/out there. Almost immediately, the Snowdome and Panic peak is again visible on your right. Continue uphill along a good trail, soon you will arrive at a trail fork. Take the left fork (straight ahead) and continue along the easy trail as it climbs to the top of a pretty big moraine. From here, you have a good view of the Blue glacier (below) as well as of the Olympus mountain with several peaks and glaciers. The trail now turns left and follows the top of the moraine (quite some way) until you see a cairn and a clear path off to the right near some vegetation. Descend here, a bit steeply, on loose gravel in a few zig-zags to a snowfield below. Angle across the Blue glacier from here on a course that will take you slightly left of the distinct rocks that are located to the right of the icefalls that you view towards the central part of the (lower) mountain slopes. You will be ascending the glacier while crossing, but only very gently. 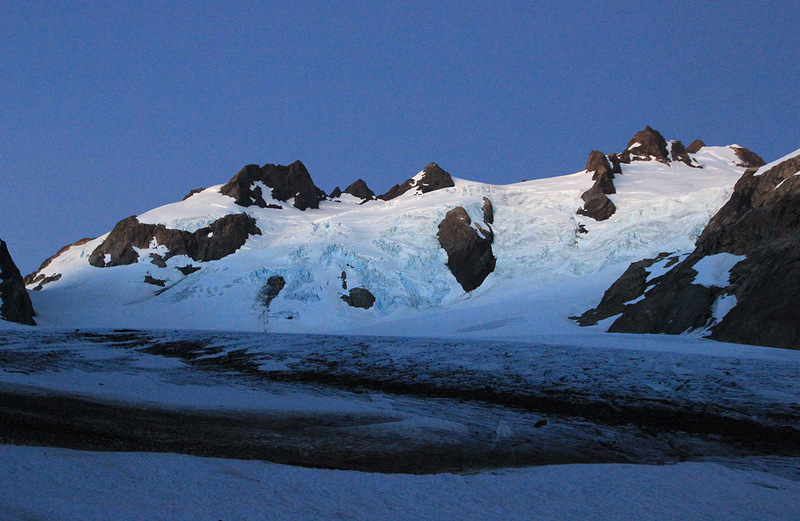 The Blue glacier itself has few crevasses that are substantial, but as always on a glacier you should be alert. 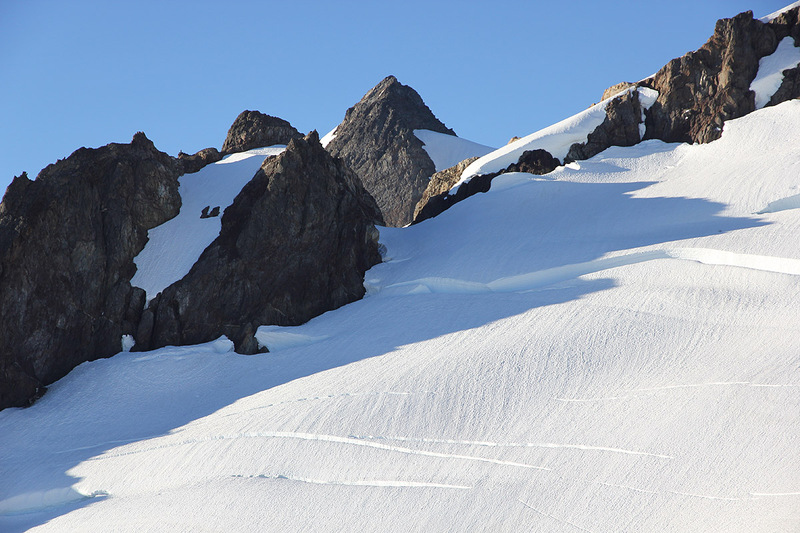 On the other side of the main glacier, pick a natural route up the snow slope that runs left of the rocks. There are normally bigger crevasses in this area. 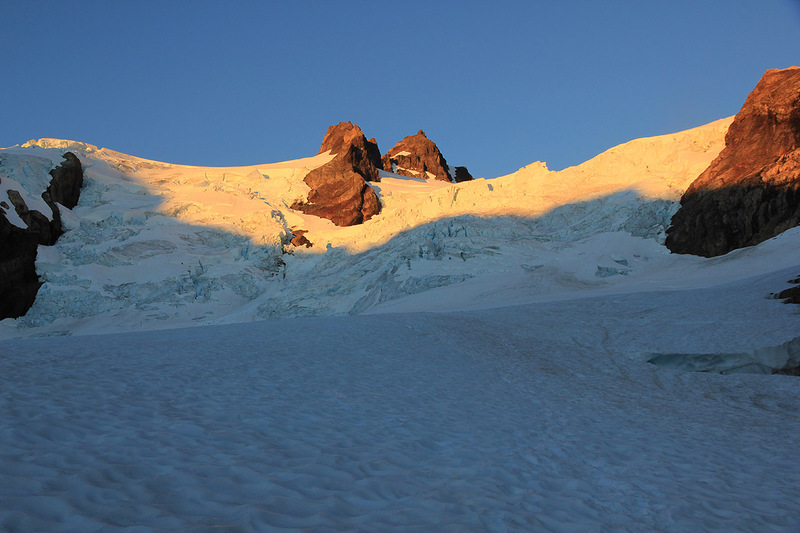 The objective is now to climb the Snowdome (above) by ascending snowslopes (these are more or less straight ahead, well to the right of the icefall) then traverse right higher up. Do not go up (too early) snowslopes on your right that may end with rocks. Gradually, this path curves right, the best route is still to climb fairly high before traversing right. 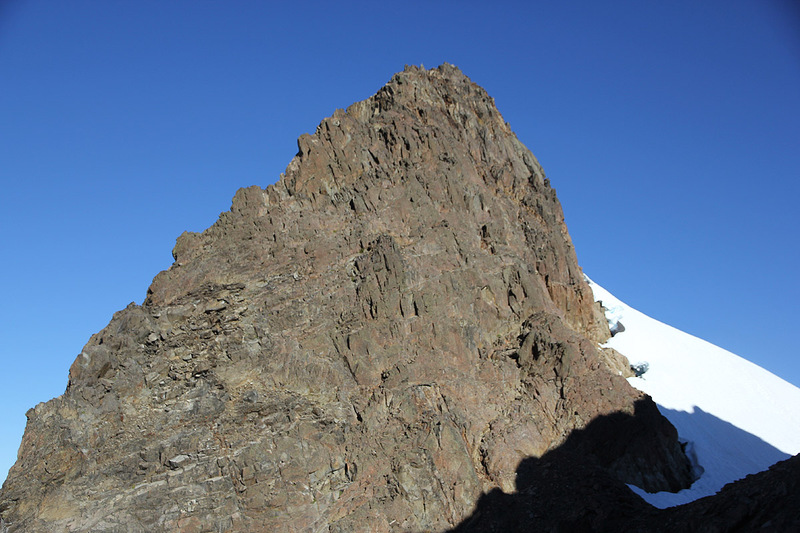 In this way, you will reach a fairly flat area above the rocks, approximately at elevation 1950 meter. From here, continue directly uphill (west) on fairly easy snow until you reach more gentle slopes higher up. As you are now on the Snowdome, turn more south-west, we passed waypoint N47:48.652, W123:42.244, elevation about 2080 meter. Locate Crystal Pass, this is the distinct pass quite a bit to your left, several horizontal crevasses tend to break the slope across to there. 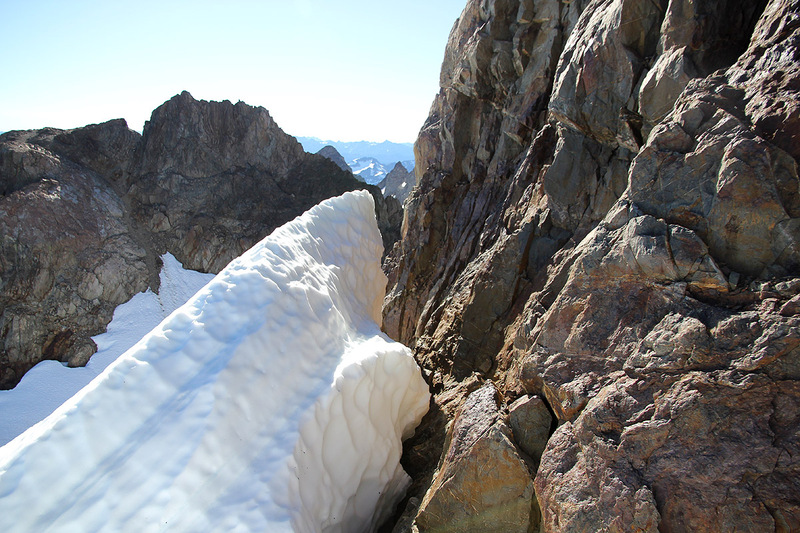 Find a route that avoids these crevasses, typically gaining the snowslope high enough to traverse left pretty much directly into Crystal Pass. This pass is roughly at 2200 meter elevation. Cross through this nice passage, turn right and climb the short, but somewhat steeper snowslope in order to gain the upper part of the Blue glacier, directly south of the Five Fingers ridge. 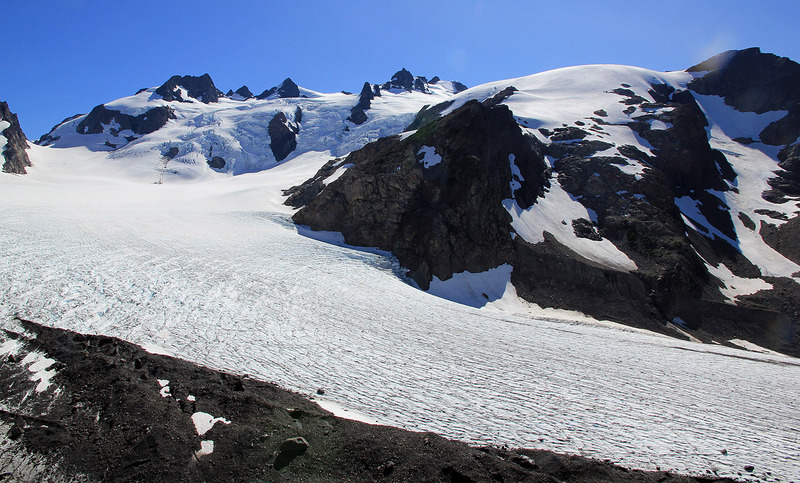 Ascend the glacier towards, but below the summit ahead (called the False summit). Stay on gentle snow and make a slightly ascending traverse (to your left) below the False summit, this will get you back onto rocks south of the False summit at elevation near 2350 meter. 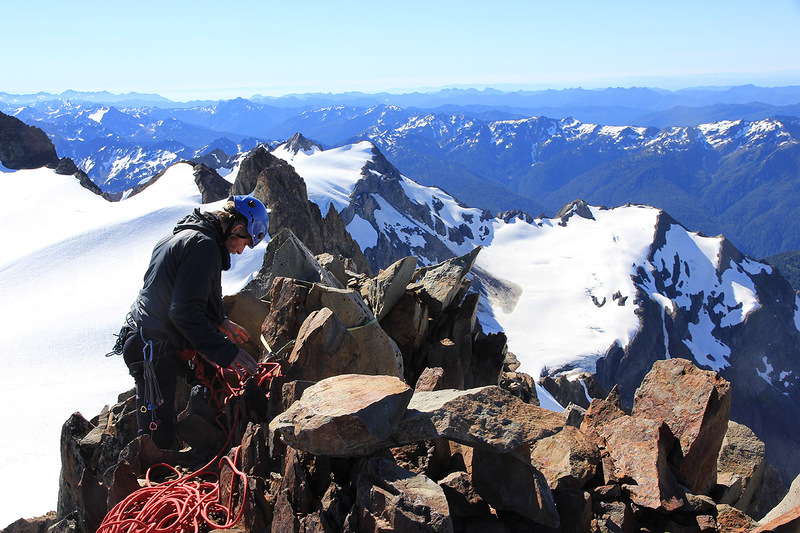 Pick up a climbers trail (fairly obvious tracks) that will take you on a rock traverse leading directly into the saddle between the West summit (Mount Olympus) and the False summit. This route first descends a little, then traverses before climbing a couple of easy steps in order to gain the saddle. This traverse is mostly (YDS) class 2 with a couple of (easy) class 3 moves. You have now arrived in the saddle, location N47:48.027, W123:42.543, elevation about 2360 meter. From here, the summit rock looks pretty steep and difficult, but there is a nice route. 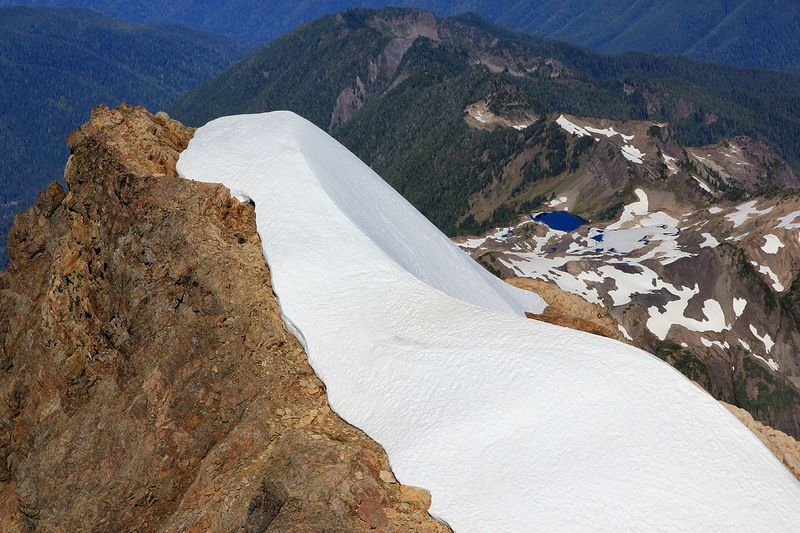 First, climb the snow slope (steeper) that is just to the right of the summit rock. As you gain this snow (shoulder), the next step is to locate an easy rock ramp that starts on the left (when facing the rock) side of this snow shoulder. 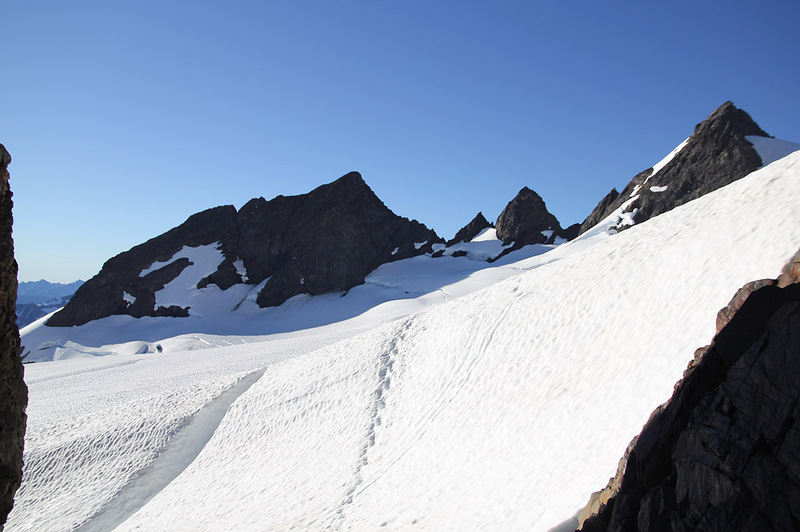 In order to get there, either traverse left on the snow, slightly below its highest point, or follow the rock going left. There may even be a gap between the snow and the rock that may be followed left, however be careful if this gap extends downwards (ie. is a proper bergschrund). As you reach this (rock) ramp, leave you axe and crampons and proceed up this ramp (YDS class 2+). Do not climb too high, there is even a small dip, continue until the ramp ends. From here, climb up (slightly right) (YDS) class 3 until you arrive directly below a 3 meter high, vertical crack. This is the (YDS class 4) crux of the climb. This crack has good holds and good places for your feet. It is steep, but knowing that all difficulties end just at the top of this 3 meter crack should make most people (that are here) climb this without much difficulty. 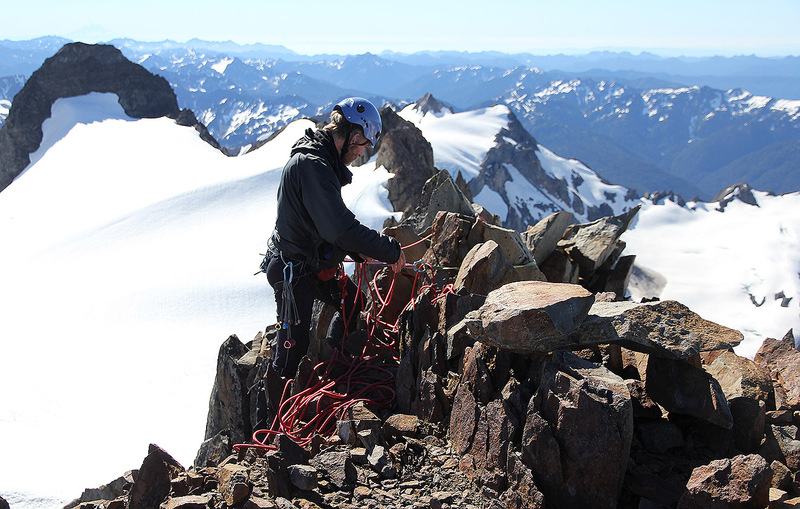 From the top of this crack, follow the easy ridge a short stretch to the summit. We drove from our Seattle HQ Sunday mornong and caught the 0850 ferry just perfectly, one of the very last cars onboard. A quick stop in Port Angeles to pick up permit, then onwards to Forks for a good, American style lunch. We knew we had a long hike ahead! We left the parking lot at 1500 and arrived at the Guard Station campground by 1810. To me, the most impressive aspect of this area are the enormous trees. Yes, I have seen redwoods, but this temperate forest with gigant trees in all stages of their life cycle, how they create the favorable conditions for all other plants in the area, it is truly an experience that leaves a permanent stamp in ones memory. 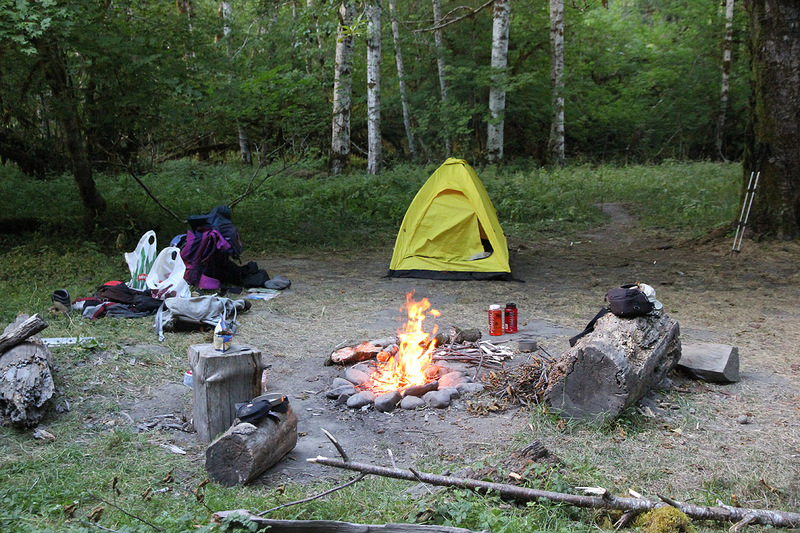 We had a pleasant chat with ranger Sam, then pitched the tent at a nice spot where we could have a fire right next to it. Slept well. Monday, this was designed to be an easy day. We left at 0800 and made our frist stop at the High Hoh bridge. The gorge is surprisingly deep and the bridge certainly serves a purpose. We arrived at Elk lake by 1030 and took a longer break for rest and looking around. Leaving at 1100, the last and more alpine like section of the trail brought us up the hillside with a significant drop on the right. 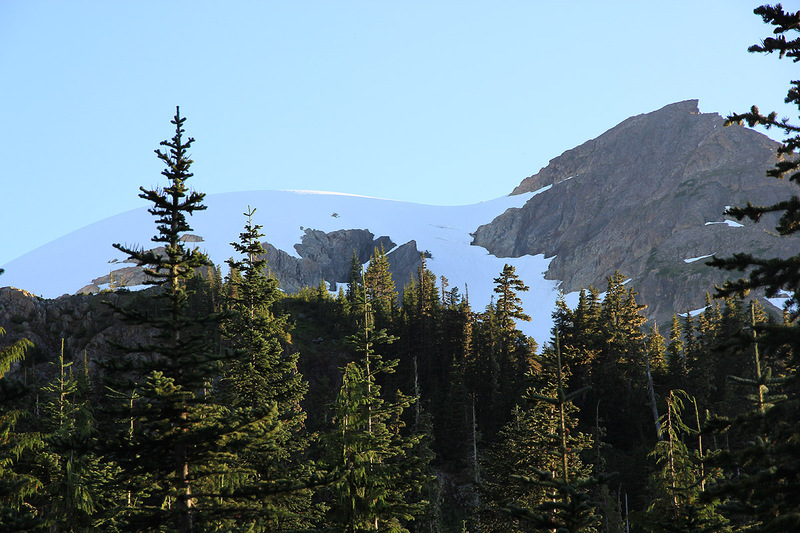 There is a landslide area that now needs to be descended before the final stretch to the Glacier Meadows campground. We arrived at 1215, so the afternoon was at our disposal for rest and a short exploratory hike up to the moraine overlooking the Blue Glacier. Later, we did stroll up to the moraine. 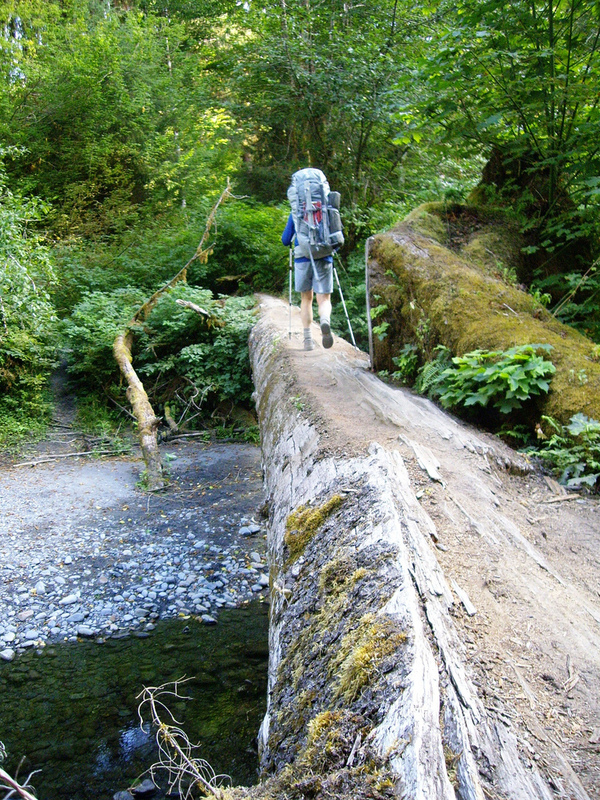 This walk marks the end of the trip for many hikers on the Hoh river trail. 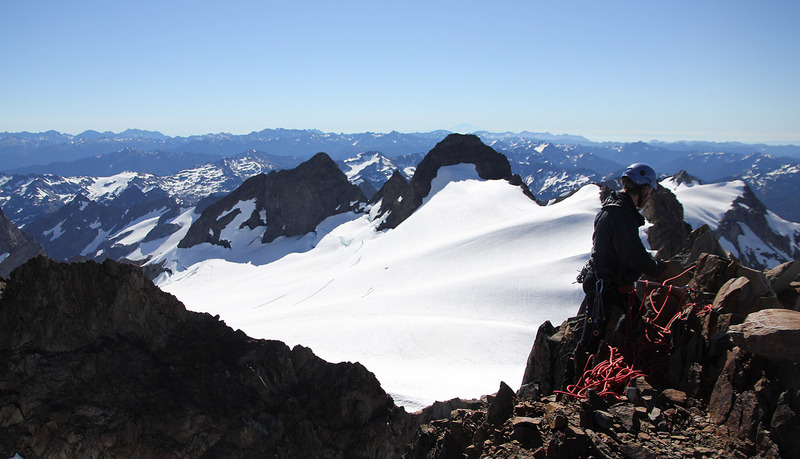 It is certainly worthwhile, the view from this moraine is simply outstanding. The Olympic mountain with white glaciers and several rock summits coming out of the ice. 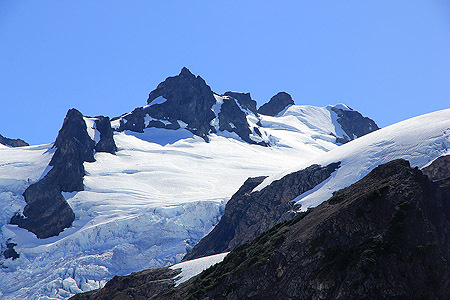 The white Snowdome extending from Panic Peak towards the highest summit. The West peak (which is the highest), can be seen in the distance. From this view point, it does look steep. 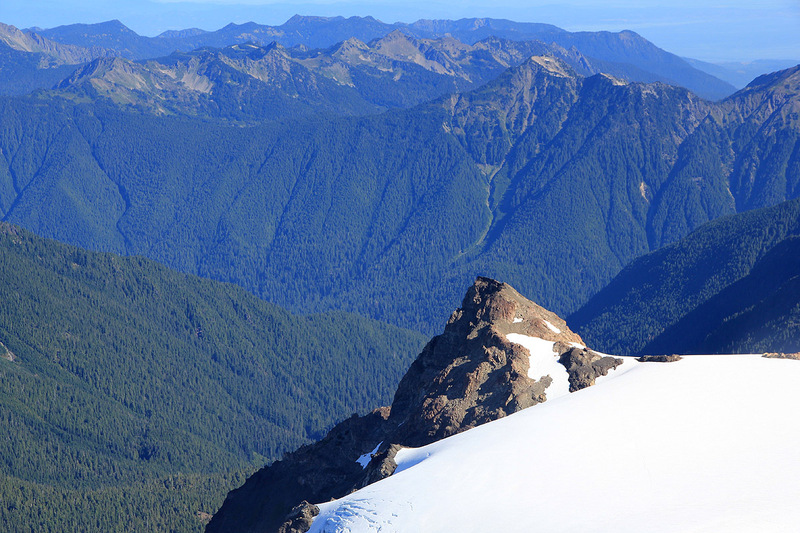 One can also look back down towards the Hoh valley. I walked back up past the ranger station just before sunset to have some fresh air and a last look to the Snowdome that we would be crossing the next morning, then back to the tent for a good sleep. 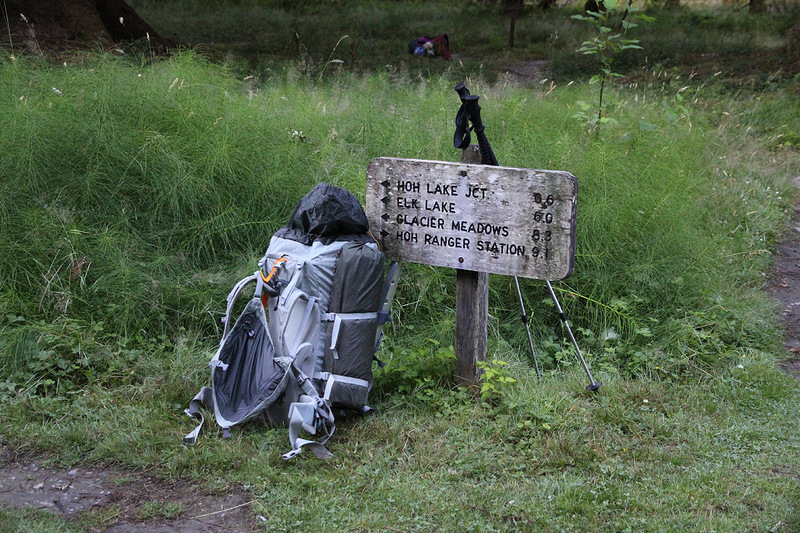 The next morning, we left around 0500 using our lights along the trail to the moraine. We got to the ridge by 0530 and could put away our lights. The crossing of the Blue glacier was easy and soon we were ascending the snow slope in order to gain the Snowdome. After gaining the small plateau above the rocks, the bootpath travesed up left. We followed the path, although I considered this line less safe than a direct ascent of the Snowdome. Eventually, the path turned more right and gained the top of the Snowdome confirming my earlier reflections. From here, we crossed fairly flat terrain while giving the slope that connected left to Crystal Pass a careful look. 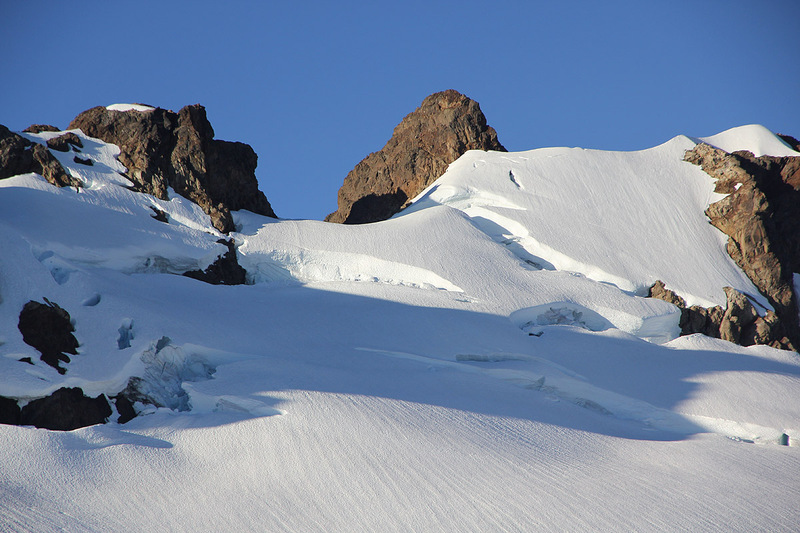 The summit is straight ahead, however crevasses block the way and a more indirect route left and through Crystal Pass is required. The route was pretty obvious, gaining elevation pretty early, then traversing horizontally directly to the pass. Crystal Pass is a nice place, what a perfect way to traverse from one side of the rocks to the other! 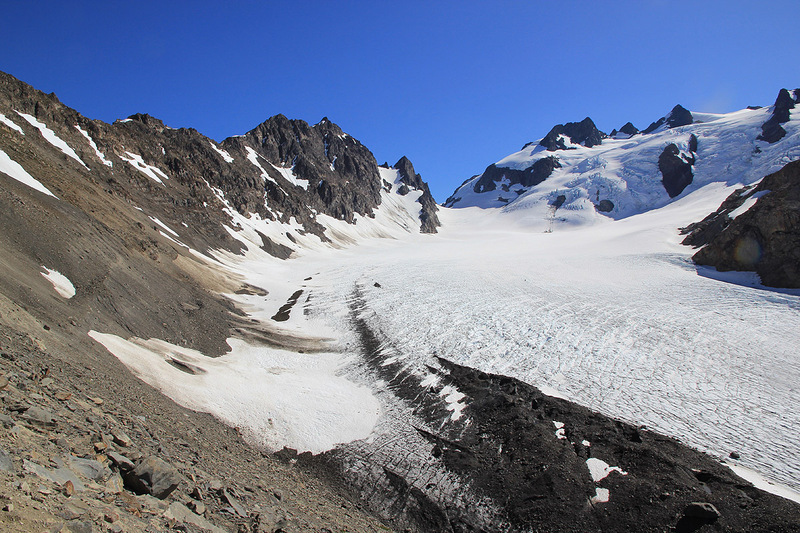 The views really open up to a new glacier and new peaks as you walk the few easy steps across. On the other side, going more uphill, we could easily see the two routes. One track leading more steeply up in order to climb across the False summit, the other forking left and climbing more gently to the edge of the rocks. We took the left route and got onto the cliffs where crampons needed to come off. At first glance, the terrain across to the main saddle looked quite nasty. However, upon closer inspection, the route which is easy to follow, is quite straightforward. Perhaps a couple of class 3 moves, otherwise just hiking across. In the saddle, we met the party that had been camping next to us at Glacier Meadows. They had left already around 0100, one person had been waiting in the saddle while the other two had climbed the peak. We climbed the snow-shoulder and decided to leave most of our equipment there. The access to the rock ramp was easy and the route quite obvious. The rock ramp ends abruptly and looking uphill, we noticed the crack. What we did not know was the fact that the climb really ends on the top of the crack. In this respect, some trip reports I had read were rather misleading. 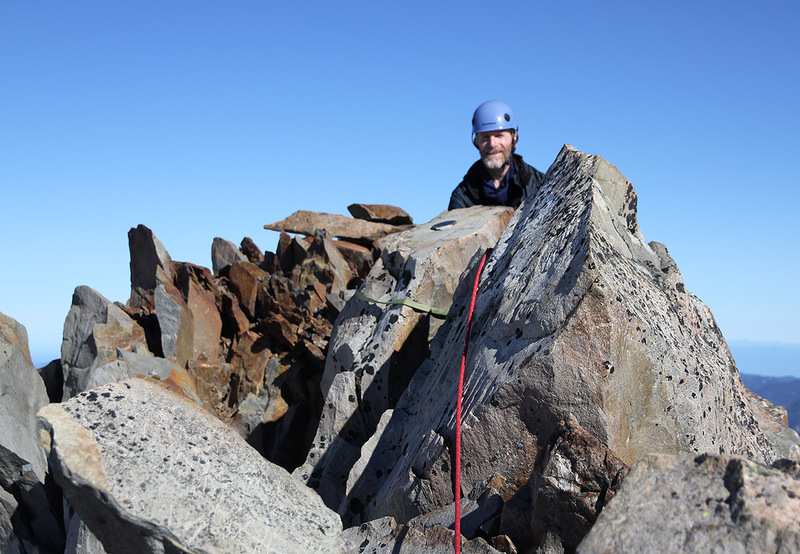 Thus, since we carried the rope for abseiling back down, I suggested that we also use it to protect what I believed would be a a full pitch of climbing from the base of the crack to the summit. Rob set out as I protected him from below, the crack was as easy (or perhaps even easier) as it looked. I followed and the big surprise was that the route is just easy scrambling above the crack. We were soon at the nice summit, arriving there at 1000. A very nice and very special summit indeed. We had pretty good weather and a good view. 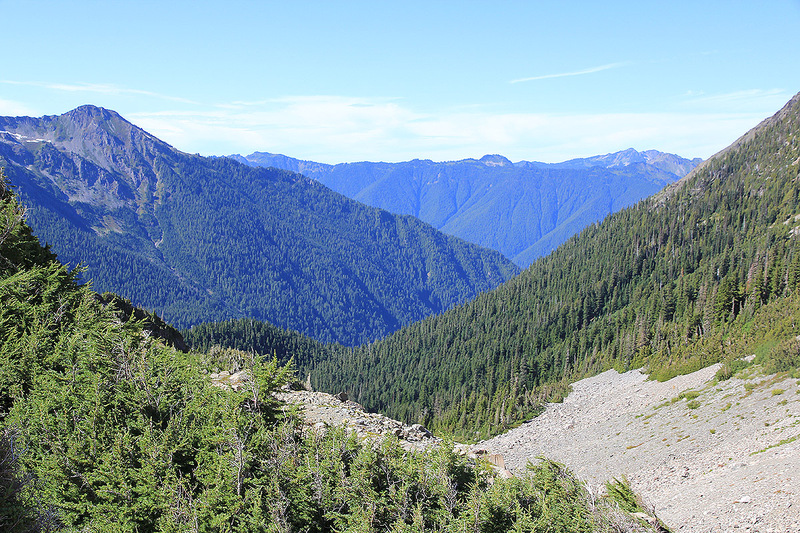 The wilderness all around, one can see the outline of the deep Hoh valley that we had walked in order to get here. We started to look into descending at 1030. The abseil consists of two legs, a short stretch, then a long one, ending directly back down on the snow shoulder where we had left gear. Testing abseil anchors and proceeding carefully while enjoying the nice day made us spend quite some time and we where back down in the main saddle at 1130. From there, it took us two hours to hike back to the top of the moraine where we had a 15 minute break talking to tourists. We were back in camp at 1445 after a very memorable day. The next morning we left camp with the first light at 0545 and were back out at the parking lot at 1215, we had several breaks of about 15 minutes each along the way. Our Olympus expedition started as it finished - with a meal and a bottle of Alaskan Amber beer at The Lodge Restaurant in Forks. Also see the nice picture story by Rob. 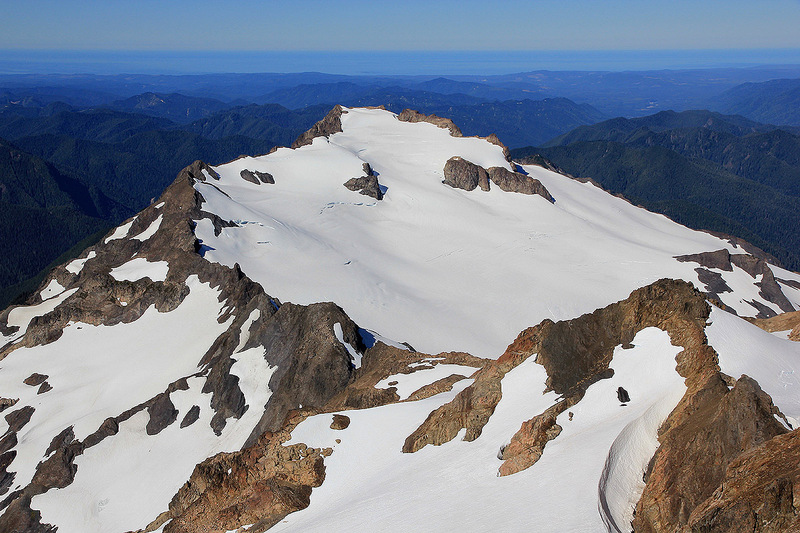 Summit Panorama, from Mount Baker to Mount Rainier. 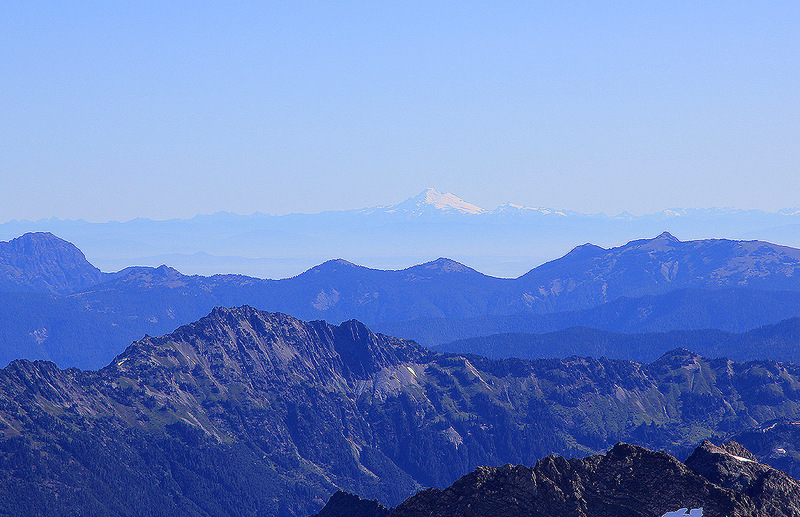 Summit view, north-west towards Mount Baker. 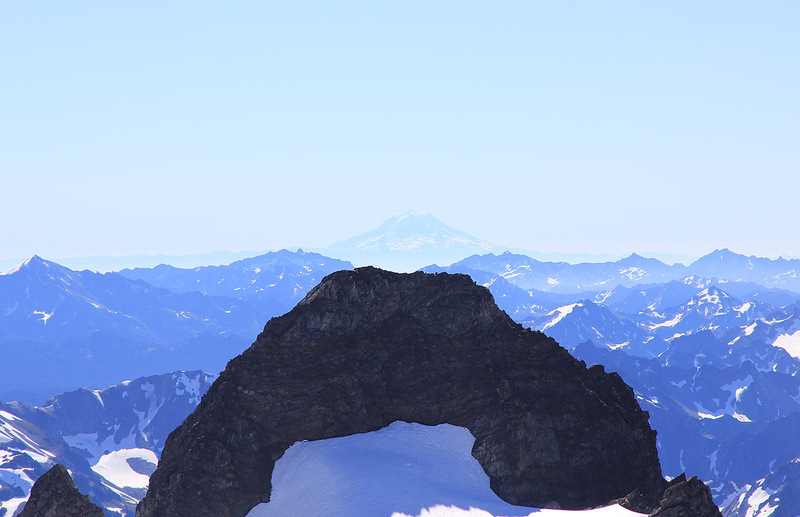 Summit view, west towards Mount Rainier. Summit view, across Snowdome and Panic Peak. Summit view, Rob on the summit. Summit view, continued from the previous picture.